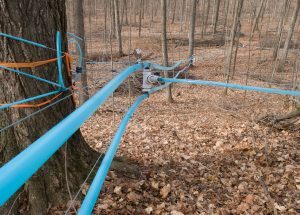 A new method of sap collection, patented by researchers at the University of Vermont, aims to increase yields and reduce time from establishment to production, by collecting sap from plantations of densely spaced maple saplings. In conventional sap collection, sap is harvested each spring from a sugarbush. A sugarbush consists of “naturally-regenerated” maple stands, thinned by the producer to a density of 80 producing trees per acre (Perkins & Van Den Berg, 2013). Trees may be safely tapped upon reaching a diameter of 8 inches at breast height; a maple tree typically requires 40 years to reach this size (Perkins & Van Den Berg, 2013). Conventional sap harvesting. Photo by David Barker, 2010 (cropped). In the sapling plantation method, up to 12,000 saplings per acre are arrayed in a grid pattern, with as little as 1-2 feet of spacing between adjacent rows and columns (Driller, Gandela, & Watson, 2018). Immediately before reaching spring temperatures required for sap-flow, one shoot from each sapling is cut 6-12 inches below its tip, and rubber tubing affixed over the entire face of the cut to collect sap (Perkins & Van Den Berg, 2016). At the end of each producing season, new growth buds emerge from the bark and most saplings continue to mature unharmed (Perkins & Van Den Berg, 2016). This method allows sap harvest to begin as early as 3 years after planting, upon saplings reaching a diameter of 2 inches at breast height (Perkins & Van Den Berg, 2016). While individual yield per sapling was found to be extremely low, increased planting density caused total yields to be improved by 500%-1000% over the same area land compared to conventional sap collection (Perkins & Van Den Berg, 2016; Driller, Gandela, & Watson, 2018). The inventors of the method analogize sapling plantations to high-density apple orchards (Perkins & Van Den Berg, 2016). The sapling plantation method follows the high-density orchard model of high tree density and lower yield per tree, a larger initial financial and labor investments on tree clones, and a focus on early yields. Like high density orchards, sapling plantations “could be [cultivated] on open, flat land as a perennial agricultural crop” (Perkins & Van Den Berg, 2016). The development of high yield, low establishment time sap production may affect Quebec’s market share of international syrup production, by increasing the economic feasibility of opening new syrup operations. In the last decade, the Fédération des producteurs acéricoles du Québec (FPAQ) has allowed Quebec syrup production to expand dramatically, with both domestic consumption and exports increasing in volume and revenues. Despite this growth, Quebec has lost 10% of global market share in maple syrup over the past 15 years due to foreign production growth outpacing growth in Quebec (AAFC, 2018; AAFC, 2015; AAFC, 2014; Moreau, 2018). The sapling plantation method could exacerbate this trend by further increasing the rate of foreign production growth, while production growth in Quebec is limited by the FPAQ to protect producers from a decrease in profit margins. The new method has also sparked debate over ecological considerations. One view holds that sapling plantations could eventually threaten the protected legal status of sugarbush by rendering conventional production obsolete. Additionally, many consumers feel that the plantation method is “less natural” and diminishes the perceived value of the syrup they purchase. The opposing view holds that it is better to produce syrup more efficiently on less land, leaving more woodland untouched by agriculture. Furthermore, sapling plantations could actually facilitate the creation of new forest on currently unforested land, if transitioned to sugarbush at the end of their productive life, by providing revenues during early establishment. Alternately, plantations could circumvent biodiversity issues experienced when planting large numbers of clones of selectively bred “high sugar” strains of maple in sugarbush: saplings can be replanted at the end of their productive life, avoiding long-term adverse effects associated with a reduced gene pool (Richardson, 2015). Published by kairockafield on February 10, 2019 at 10:52 pm under Uncategorized. The title is very straight forward and announce clearly what will be discussed. New methods of sap collection are being developed and could help Quebec to remain a leader in maple products production, which will be an issue according to Kai. The structure of the article is very articulated and logical. As a reader, it was easy to read and understand what the point was. It is interesting to learn about the actual context of maple syrup production and the methods used since it is not a production that is covered in our program. As a consumer, I think the last paragraph on the cons of this type of high yield production are what I relate to the most. Indeed, this production would loose a lot of its charm. Maybe adding a small conclusion with a wrap up and summary of the situation would make the article even more complete. In general, I really appreciated this article, good job!!! 2. The message of the author is that new methods of harvesting sap are currently being implanted on the market, and it can be a big game changer for the industry. 3. I liked the way the debates regarding this new sap harvesting method were addressed, as both opposing views were presented fairly, and it lets to the reader the opportunity to pick his own side. 4. For me the strongest argument presented was that with the new method, the yields were improved “by 500%-1000% over the same area land compared to conventional sap collection (Perkins & Van Den Berg, 2016; Driller, Gandela, & Watson, 2018)”, which is very impressive. 5. I felt like a huge amount of information was presented to the readers in a short paper, which is a bit overwhelming. I would maybe pick less points on which to debate and elaborate a bit more on each of them.